Marine audio gear at Crutchfield? Crutchfield is best known for our car audio and home audio expertise, but we have plenty of products and advice for boaters, too. We stock a wide variety of rugged, durable marine audio equipment, and with several boaters on staff, we know what works and what doesn't. 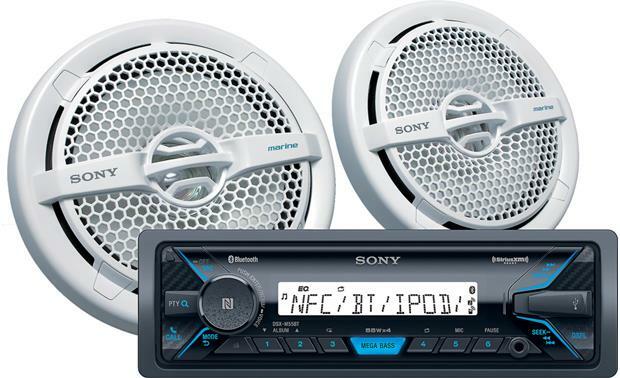 In addition to receivers, speakers, subs, and amps, you'll also find a number of marine-rated products that allow you to listen to satellite radio on the water. We also stock all the cable and gear you'll need to hook everything up in your boat. When you outfit your boat at Crutchfield, you get the peace of mind that comes from our more than 30 years of mobile audio experience, along with our lifetime technical support. Have questions? Just pick up the phone and call our friendly Advisors at 1-888-955-6000. They'll be able to help you decide what you need to build the audio system of your dreams for the boat you always dreamed about owning. The water, salt, and sun that make boating so much fun can wreak havoc on your boat's electrical components. If your gear isn't designed to withstand this environment, it won't last a season. That's why it's so important to choose the right gear for your boat's audio system. 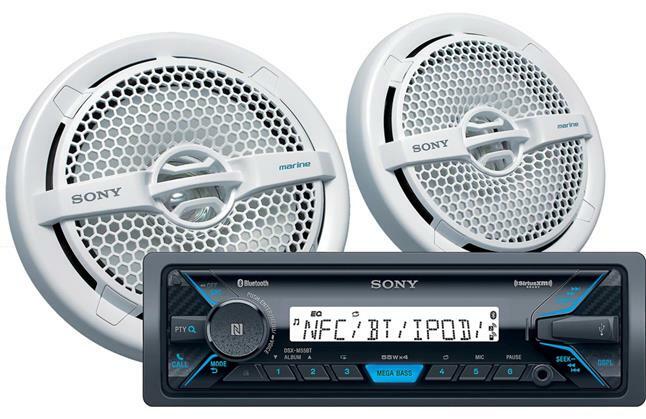 From your CD receiver to your cables, everything needs to be ready for life on the water. Water-resistant — Can handle splashes and light rain, but not built to handle submersion. Levels of resistance vary by manufacturer. UV-resistant — Designed to withstand sun damage. Found on receiver faceplates, speaker cones and grilles. Waterproof — Able to be fully submerged, though depths and the amount of time underwater vary by manufacturer. Anti-corrosion — Specifically designed to resist rust and the corrosive effects of salt water. Examples of anti-corrosive features include coated circuit boards, plated connections, and a rust-resistant chassis. Receivers — You'll want to buy a marine receiver with a coated circuit board, a water-resistant faceplate, line-level outputs for sending signals to an external amplifier, and satellite radio controls. A weatherproof faceplate cover and a watertight remote control are great accessories to add on. Speakers — When you're buying marine speakers, look for plastic cones (such as polypropylene) and rubber surrounds for maximum weather protection, corrosion-resistant mounting hardware, and enough power to pump out tunes over wind, water, and engine noise. Be sure to look at where you're mounting the speakers — if your speakers are near your compass, they should be magnetically shielded. 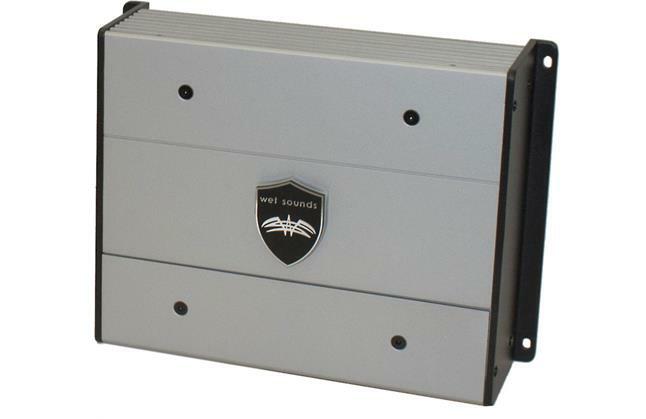 Amplifiers — A quality marine amp will feature coated circuit boards, plated, non-corrosive connectors, and plenty of power. Subwoofers — Bass matters on boats, too, so it's smart to invest in a sturdy, powerful marine sub. Look for plastic cones and rubber surrounds for maximum weather protection. Free-air rated component subs or enclosed subwoofers are good for the challenging mounting locations you'll often encounter in a boat. 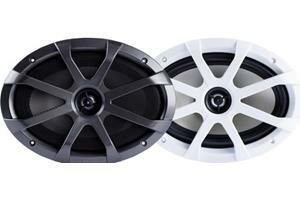 If you do not plan on adding an external amplifier, look for a powered enclosed subwoofer. 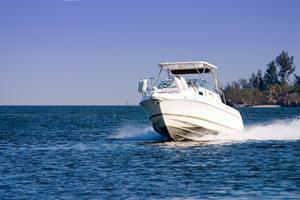 Speaker wire and cables — Marine-rated wiring is an essential part of any marine audio system. All wires should be tinned; bare copper can corrode quickly in salt water conditions. 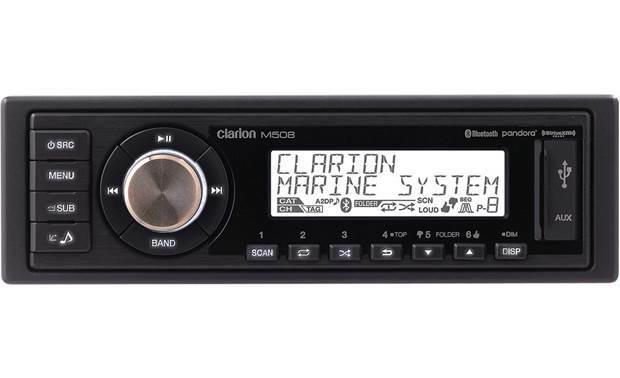 Satellite radio — SiriusXM satellite radio is truly a "must-have" marine audio component, because satellite radio reception extends up to 200 miles off shore. 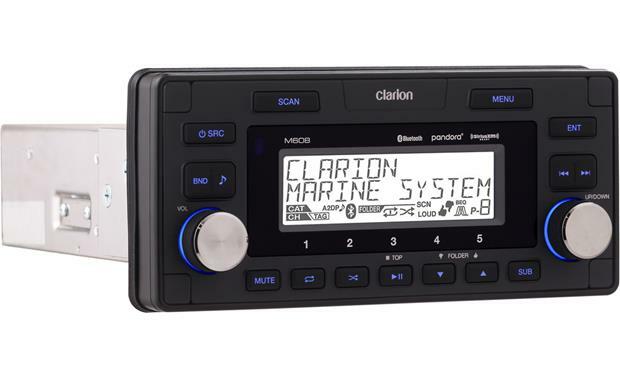 Many marine receivers are satellite radio-ready, which means you can add an external tuner, mount it out of sight, and run the cable into the radio. 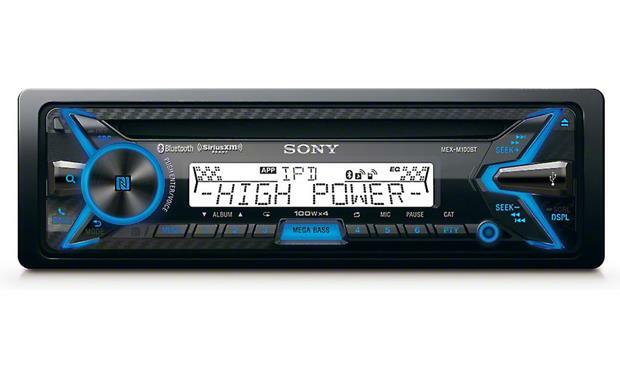 Even better, plug-and-play satellite radio tuners can be transferred from car to boat to home. Look for a marine kit for your plug-and-play tuner, including a marine-rated satellite radio antenna. GPS — Okay, so it's not technically an audio component, but most boaters wouldn't leave shore without GPS navigation. When considering which GPS unit is best for you, look for conveniences like rechargeable batteries, a bright color screen that won't wash out in direct sunlight, Blue Chart compatibility, and, of course, weather resistance. WAAS (Wide Area Augmentation System) compatibility is another good feature to look for in a marine GPS unit; WAAS-enabled GPS units have up to five times better accuracy, which helps keep you out of the hidden rocks or other underwater trouble. Power Inverter — A power inverter is an incredibly handy thing to have on board, especially with smaller boats, because you can charge your phone battery, a laptop computer, or run small electronics. Be sure that the inverter has a Ground Fault Circuit Interrupter, which protects you against accidental shocks. 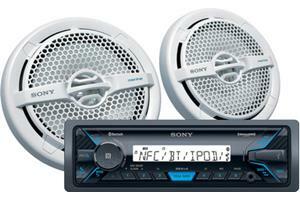 Unlike most cars and trucks, there isn't one ideal place to install audio equipment on every boat. Different models have different power and space limitations, so each installation presents a unique set of challenges. What sounds great in a Carver might not even fit in a Donzi — and what's great for a motorboat might not be ideal for a sailboat. If you're replacing your boat's existing radio and speakers, you can probably use the same mounting locations and wiring. Otherwise, you might need to cut some paneling or run new wires for the components. Most marine receivers are a standard single-DIN (2" tall) size, and connect to a 12-volt marine battery. 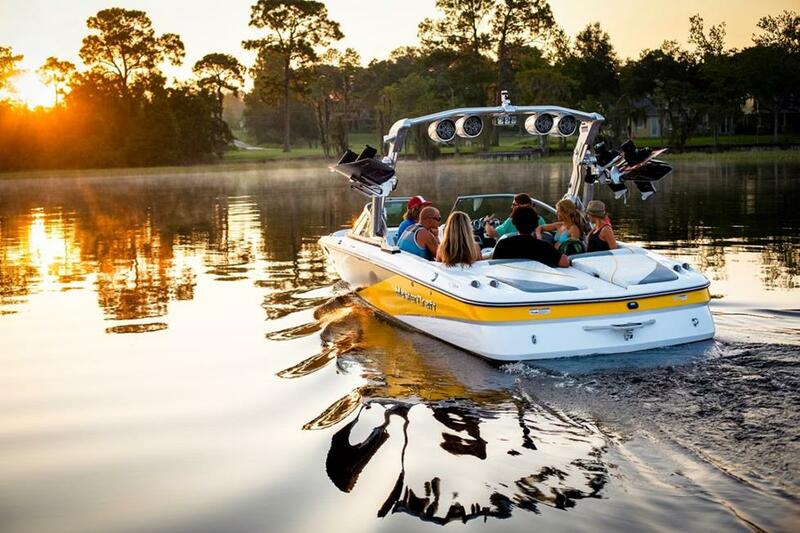 Amplifiers and subwoofers can go in a compartment under the seats, under the bow, or even on a wakeboard tower. Midrange and midbass speakers and tweeters can fit into side panels or the dash panel. It really depends on your boat, your needs, and your tastes. Grounding your electrical components can be a challenge in a boat, though some do have specific, dedicated grounding plates. 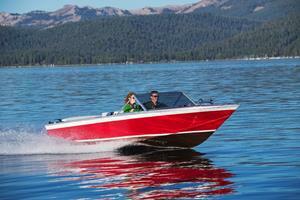 Consult your manufacturer for more information on where to ground components in your boat. Materials that will stand up to the elements — Nothing ruins a party like audio equipment that can't handle the elements, so make sure that all of the electronics on your boat are protected against salt, sun, and water. If you need an extra measure of protection (or want to use an unprotected component on your boat), install a universal cover. It will shield your receiver from the outside world, then flip up out of the way so you can get to the controls. A waterproof, wired remote control is an excellent alternative to exposing your receiver to the elements — you can mount the radio inside a watertight compartment and not worry about shorting out your tunes. Good specs — Better specs mean better sound quality, on land or at sea. For receivers, look for a high CD signal-to-noise ratio, a wide frequency response, and plenty of RMS power. If radio's your thing, check the FM sensitivity spec — the lower, the better. 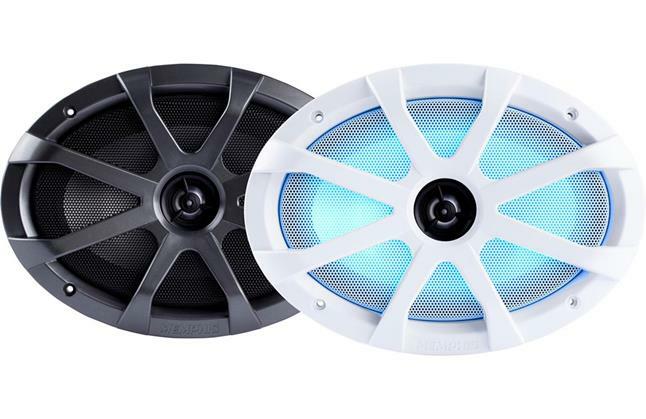 Speakers should fit nicely into your cabin panels, be made with UV-resistant materials, and handle plenty of power. High power — Since you'll be listening to your music out in the open, you'll want plenty of power for clean, clear sound. Aftermarket marine receivers come with built-in 4-way amplifiers, but if you love it loud or want to drown out the nautical background noise, you might want to consider adding an external amp to your system. 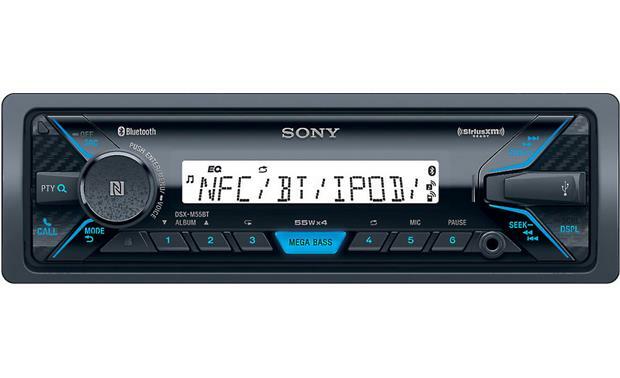 Audio options — The days of the basic, one-trick CD receiver are long gone. 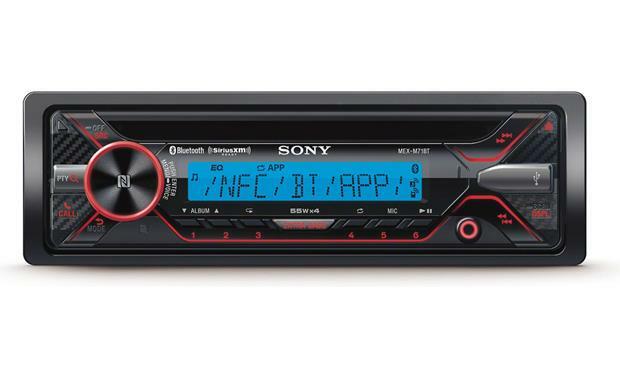 From satellite radio controls to connections for your iPod, today's aftermarket components offer a wide variety of entertainment options. If you have a larger system in mind, get a receiver with an auxiliary input, which will allow you to add another audio source later. 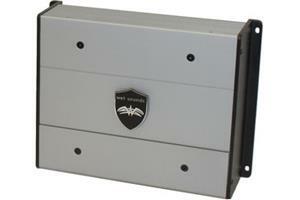 Multiple sets of preamp outputs make it easier to install component amplifiers and subwoofers. And if your cruising will take you out into the wild blue, consider the entertainment value of satellite radio — the signals can reach up to 200 miles offshore. 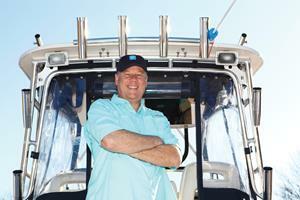 Marine remote controls let you control your receiver from the helm. Marine covers and mounts protect your receiver from sun and water, and let you mount your handheld electronics on your boat. Satellite radio has become popular with boaters everywhere. These installation tools will simplify your installation. Don't forget the wires, including marine patch cables and marine-grade power and speaker wire. Tim, I've sent your question to our sales team, and they'll be contacting you via email soon. For immediate help, you can contact them via phone or chat. Oscar, There are ways to do this. 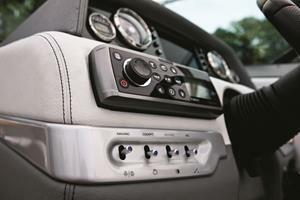 For example, a marine-rated 4-channel amp like the Soundstream ST4.1000DB can do the job. I've sent your question to our sales team, and they'll be contacting you via email soon. For immediate help, you can contact them via phone or chat. I just bought a beautiful 24 Vectra cruiser. It is surrounded with speakers, but no radio. It's a 2005 boat, kept by original owner, in perfect conditions. We want to definetly play music and even news in our new boat, so I thought of using our smart phones. I thought to myself, who needs a radio today with our smart phones. So here is my question, no radio, but surrounded by speakers, so, is there a anyway to plug something to the speakers, without using a radio, but use some kind of new gadget that cab connects our phone to our boat's speakers through bluetooth instead? Matt, With a question like that, it's always better to have a conversation with a real live human. Give us a call and talk to one of our advisors. We can help you choose the right gear for your boat. plus we csn give you some advice on where and how to install it. Hi There, I have a fourwinns horizon 200 2007 and a Clarion m606 w/ 4 kicker KM65 speakers and I would like to add an amp and subwoofer or subwoofers. What do you recommend for subs and the placement. Back bench or footwells ? What would you recommend for equipment ? Arthur, We don't know of anyone specifically, but we do know that most full-service boatyards can handle basic marine audio installations. Your fellow boaters will undoubtedly know who the best people are, so ask around next time you're at the marina. We can help you choose the right gear and design your system, though, so I've sent your question to our sales team, and they'll be contacting you via email soon. For immediate help, you can contact them via phone or chat. Can you recommend an professional installation contractor for a marine application in the Moultonborough, NH. 03254 area? My DIY expertise is limited! Mike, That's great info, actually, but when you're planning a system like this, it's always better to have a conversation with a real live human. Give us a call and talk to one of our expert advisors. We can help you choose the right gear and give you good advice on how to install it. I have a 2012 Sanger V215 that has a head unit and speakers in the bow and in the main passenger compartments. I want to add tower speakers and a subwoofer and appropriately sized amp(s). The current sound system does not put out enough sound to overcome the engine and wind noises at surfing/boarding speeds. Thoughts on needs? Need more information? Jesse, Brand matters, but there are other things to consider. Give us a call and talk to one of our advisors about your boat, your current system, and your audio goals. Once we know all that, we'll be able to see what can work with your budget. I'm wanting to upgrade my sound system and right now I have (4) 6.5 speakers and (1) 10" sub. I'm looking at adding another sub and another (2) 6.5 and two tower speakers. 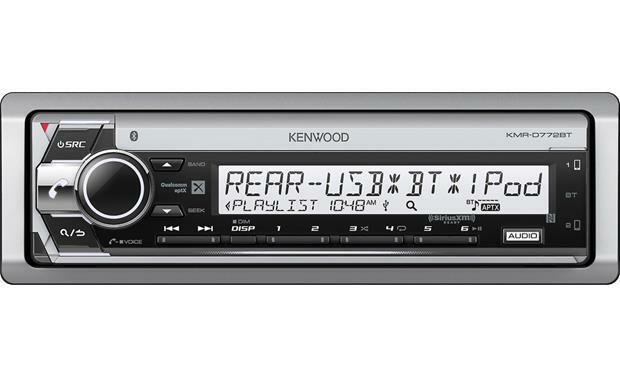 I know it all depends on brand and what not, but what is the average cost for someone to replace everything and adding those things I want along with a new head unit and amps? would a budget of 2K or would I need more to get everything I mention above. Carey, Sounds like you're off to a good start! Give us a call at 1-888-955-6000 and let one of our experts help you plan your system. Hi My name is Carey and I have recently purchased a 2000 Malibu Response with a wake board tower. The boat is like new and I would like to put a complete system in it. 2 speakers in the dash, 2 in the rear side panels (6.5), 2 tower speakers, amplifier, sub woofer and a receiver. I am very mechanical and OCD with installation, I can easily install the components and rewire the system but there is so many brands and components to choose from. I priced out J B Audio equipment to approx. $3000. I don't want to spend that kind of money not knowing if I have made the right selection or chose the correct brands. The receiver goes in the armrest to the right of the driver, so that seems to be the traditional receiver style. We are looking to put out 250-300 watts of clear sound???? Again, no expert on watts, more my son talking. I would like to get a plan together, buy the receiver, interior speakers for him for Christmas and then the rest in the spring having it ready for June. Any help would be appreciated. Jose, We don't have any info on your Donzi's stock speakers, but you might be able to get that info from Donzi or from your boat dealer. That's easier than pulling your speakers and measuring them. Which is also an option, of course. I have a Donzi 32zf 2008 I'm interest to replace factory speakers, do you know size ? Looking for best sounding speakers and subwoodpfer. John, We'll he happy to help you with that. I've sent your question to our sales team for the best answer, and they'll be contacting you via email soon. For immediate help, you can contact them via phone or chat. I have a 1995 Sea Ray 175. I currently have 2 - 6.5" dia. speakers below/in front of the rear jump seats. I also have what appears to be 2 - 5x7 speakers under the gunwales. The existing system and speaker configuration really has poor sound. I need improvement ideas. I'd like to upgrade the receiver, these four speakers, and add a sub or two (possibly an amp too). I'll also need to know how to wire this. The existing setup runs right off the battery, and doesn't have the fuses setup right. Don, Nice boat! I've sent your question to our sales team for the best answer, and they'll be contacting you via email soon. For immediate help, you can contact them via phone or chat. Paul, We'd be happy to help you with that! I've sent your question to our sales team, and they'll be contacting you via email soon. For immediate help, you can contact them via phone or chat. I have a 25' Center Console fishing boat. I would like to upgrade the sound system to JL audio with an Amp and Sub. Whats the best way to do this? Thanks!! Teri, Sounds like you're well on your way to designing a very nice system. I've sent your question to our sales team, and they'll be contacting you via email soon. For immediate help, you can contact them via phone or chat. Congrats on the boat and have a great summer with it (and your new stereo)! I recently purchased a 20 foot pontoon and would like to install a complete Kenwood marine stereo System. 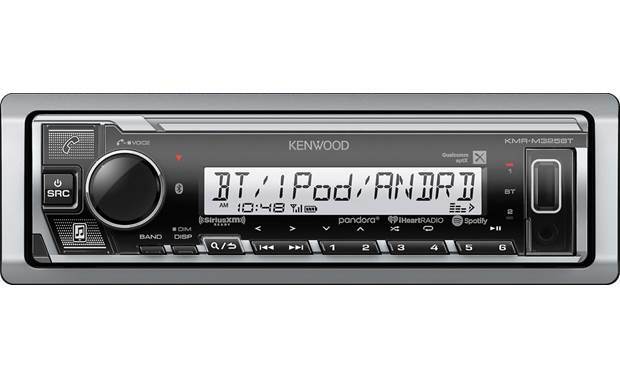 I'm leaning toward the Kenwood KMRM315BT. I would like four to six 6.5" speakers (I'm thinking KFC-1653MRW) and a subwoofer along with the correct amplifier(s). Could you tell me which items you would recommend and suggested location for speakers, subwoofer & amp(s)? Thank you! Ralph, I've sent your question to our sales team for the best answer, and they'll be contacting you via email soon. For immediate help, you can contact them via phone or chat. Seth, I'll forward this straight to our sales team, and they'll be contacting you via email soon. For immediate help, you can contact them via phone or chat. I recently purchased a 2000 four winns 18' deck boat that needs a little TLC but runs beautifully. The stereo system comes and goes intermittently so I would like to purchase a completely new set. We live in Key West, FL and the boat will be covered but stored outdoors. Mark, Nice boat! I'll forward your question to our sales team for the best answer. They'll be contacting you via email soon. For immediate help, you can contact them via phone or chat. I would like to replace the stereo on my 32 ft Nordic Tug. The receiver appears to be a typical automotive type Kenwood receiver. The speakers are small box type, with a pair in the pilot house, and a pair in the salon. I mostly listen to FM, CDs and Pandora. I appreciate your recommendations. Thanks. Rich, I'll forward your question to our sales team for the best answer. They'll be contacting you via email soon. For immediate help, you can contact them via phone or chat. Bill, We'd be happy to. 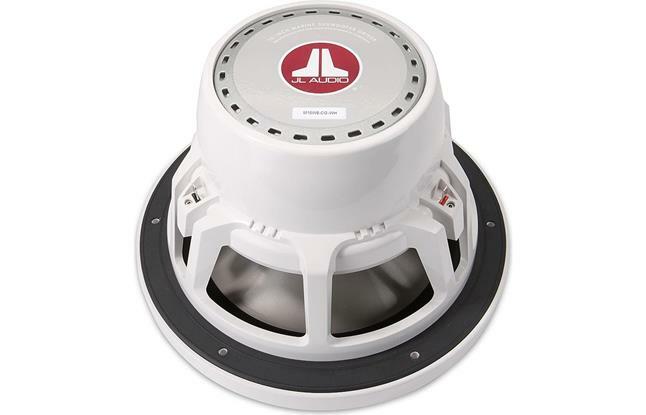 Smaller boats are (usually, but not always) easy to deal with, but if you're talking about a larger vessel that needs cabin speakers and that sort of thing, the job is obviously a bit more involved. To get things started, I'll send your question to our sales team, and they'll be contacting you via email soon. This sounds like a cool project, and we hope you'll send us some photos when you're done! If I send you a schematic layout of my boat, can help design a system for me that I can Oder from you and install myself? I have a 24 foot Harris pontoon boat and would like to install a complete JL Audio System. I would like to have (4 to 6) 6.5" speakers and 2 (10") subwoofers along with the correct amps and a head unit. Could you tell me which items you would recommend. This boat is used in Salt Water but if garage kept when not in use. I would like to have quality items, not the most expensive but not the cheapest either.